If you have just started a family and are looking for the best dentist to take care of your little one, Alligator Dental is the best choice for a pediatric dentist in the San Marcos and Seguin area. However, you may be wondering what exactly a pediatric dentist is and how, if at all, they are different from a family dentist. Today, we want to tell you what we do that makes us the best choice for children’s dentistry and why choosing a pediatric dentist is the best option for your kids as they begin to understand and appreciate their oral hygiene. Of course, all dentists go through the rigorous study of dental school. Like many specializations in the medical field, dental school takes four years to complete, which means any dental student acquires boundless information before graduation. 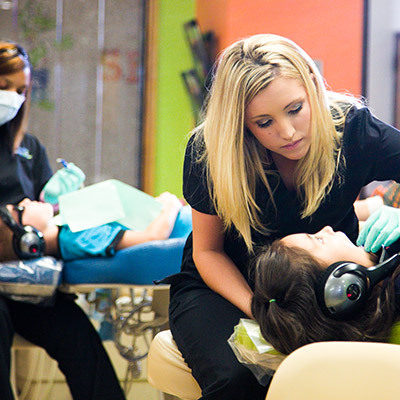 However, if a dental student wants to become a pediatric dental specialist, they are required to go through more training before they can claim that specialization. This training is similar to a residency for a doctor or surgeon in that they go through two years of formal training in this specialization to help them acclimate to the procedures and precautions necessary to work with young children. Immersion in the field of pediatric dentistry before practicing on their own helps rising dentists to acquire the skills needed to successfully treat your children’s teeth. Of course parents know what’s best for their children and will set them on the right path when it comes to dental hygiene. However, kids have an inclination for being stubborn and refusing to listen to their parents on occasion. Going to the dentist and hearing some of the same things from another source can really help kids understand the need to keep their chompers healthy. From their first dental visit to the time they become teenagers, having a dentist that specializes in growing kids teeth can be beneficial. 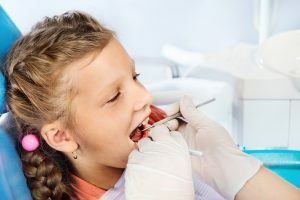 A pediatric dentist is able to walk a child through the steps that come with dental development, from how to properly floss to what foods will wear out their enamel, as well as explaining what the heck enamel is. The big difference you’ll find when comparing a pediatric dentist to a family dentist is that we focus just on your kiddos. Alligator Dental loves having parents around and wants them to be strongly involved, but we focus specifically on getting your child’s pearly whites to look their best. We aren’t a one-stop shop for dentistry for the whole family, but your kids are sure to have a quality dentist that you as a parent can depend on. 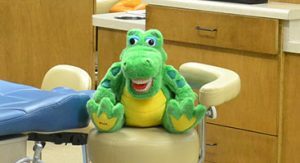 Alligator Dental loves working with young children on promoting healthy dental hygiene and oral care in a fun and inviting environment. If you want to find the best pediatric dental group in the San Marcos and Seguin areas, your search is over. Don’t wait until your child has tooth pain or suffers from a cavity before visiting us. Give our offices a call or use our appointment scheduler to ensure your children’s teeth are taken care of today!